Keyline ploughing is a straightforward agricultural technique developed in the 1950s to help Australian farms better manage water on their lands. Keyline ploughing is a specific pattern of topographical sub-soiling used to better distribute water across the land. There are two components to the keyline technique of land management: the plough itself, and the applied subsoiling design. Algoma farmers can expect increased water retention and distribution, pasture growth and soil health with the implementation of keyline subsoiling. This simple tool offers land managers a degree of resilience against drought and flooding damage associated with the current unstable weather patterns. Keyline design is an agricultural design process intended to increase the fertility of soils through water retention and redistribution. The primary outcome of Keyline design is the development of better soil structure and increased soil fertility for both crop and pasture lands. Keyline design maximizes the use of water over a specified landscape; slowing the shedding of water from higher elevations which are typically drier, and limiting the amount of water which would gather in low lying lands. Installing a keyline system on your property requires planning but is straightforward in its execution. Keyline pattern subsoiling begins by establishing the keypoint on the land base. 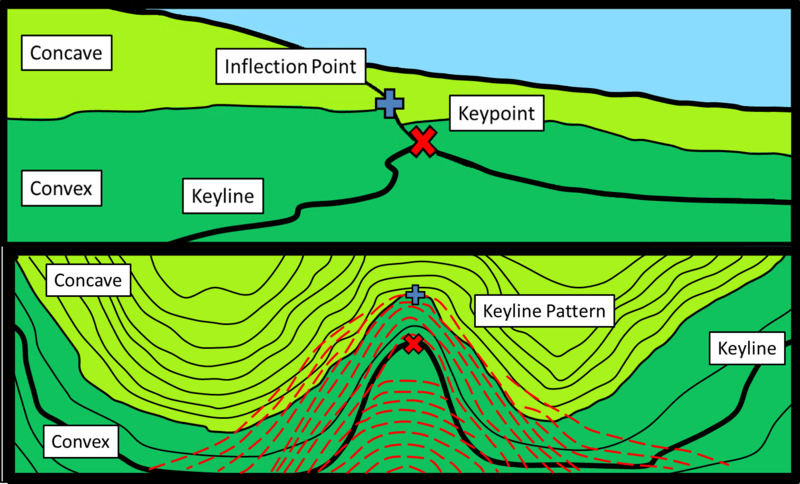 The keypoint is found at the point where the valley exhibits its steepest slope; this point is generally just below the point of inflection, which is defined as the point where the land changes from a concave to a convex shape (figure 1; top). The keyline is a special contour line that intersects the keypoint. Once the keypoint and keyline have been established, a specialized subsoiler is used to trace the keyline in a parallel manner up and down the slope. In planning the keyline layout of a farm, it is often the case that only the keypoint for each primary valley needs to be marked. Generally, keyline contour surveying costs are minimal and can be achieved with common surveying equipment such as a transit. The keyline pattern itself is then traced with the use of a specialized subsoiler (figure 2). The subsoiler was developed as a response to the unpredictable rainfall found throughout Australia’s arid agricultural lands. 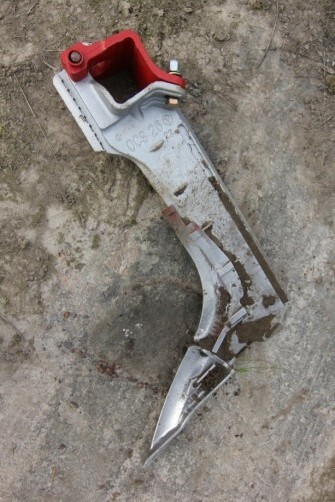 The unique feature of the plough is a specialized shank that can deeply penetrate the soil without causing a major disturbance to the soil biology structure itself, and this soil preservation approach follows in line with the benefits of no-till seed drills. Subsoiling in general serves multiple functions, the more important being breaking up compacted soils; however, the use of a Yeoman shank minimally disturbs soil microbe habitats (see research note: Soil Health and Ecology for additional information). Subsoiling increases the amount of oxygen, water, and nutrients to depths which would take years to reach otherwise. 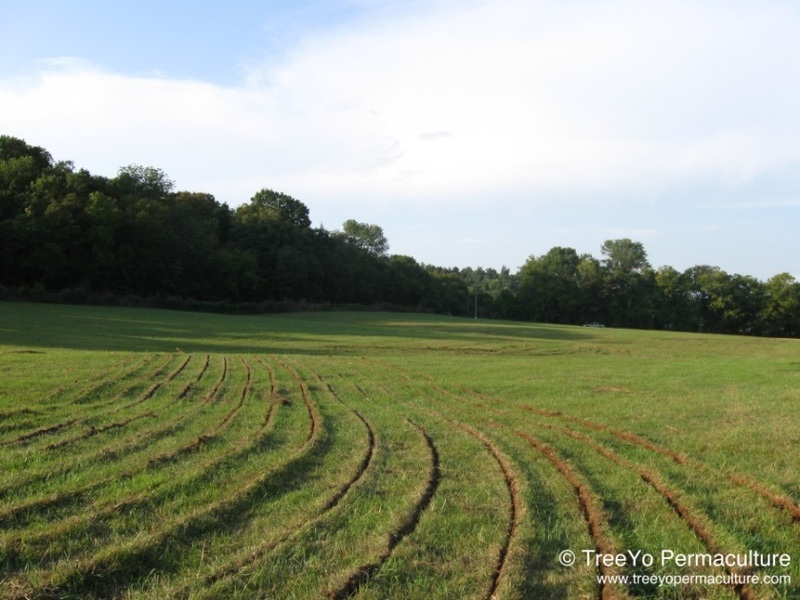 With a well-managed pasture system, subsoiling can aid in the production of topsoil, increase general fertility, and greatly increases the water holding capacity of soils. Originally developed under drought conditions, a keyline design will help to distribute rainfall more evenly across the pasture. Under heavy rainfall conditions, an installed keyline design will slow runoff under the same re-distribution mechanism and, because of the channels caused by the plough, allow a greater amount of water to be retained in the soil. Keyline design has the potential to dramatically benefit Northern Ontario farmers by improving soil fertility and by mitigating the effects of extreme weather conditions. RAIN is currently conducting a research trial at an intensively managed stocker operation on St. Joseph Island. We demonstrated the subsoiling plough at a research open house in August 2015. Initial findings have shown that the top of the ridge retains up to 4 times more water after a rainfall as compared to the control. Over the 2016 growing season RAIN researchers will continue to monitor soil moisture levels, soil health metrics (aggregate stability, fertility) and growth and yield of pasture forages. Yeomans, K.B., Yeomans, P.A. (1993). Water for every farm. Georgi Pavlov . Understanding the Application of Keyline Geometry. Thanks Cory. We will update you as we get results.